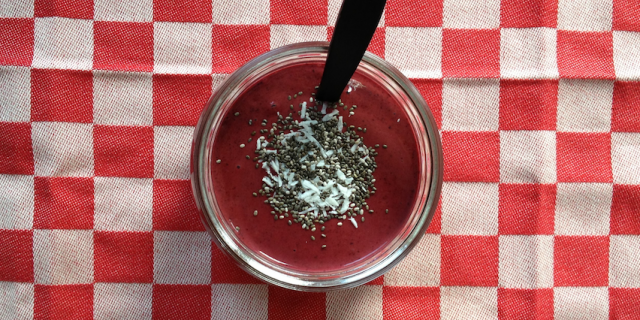 This Berry Coconut Yoghurt Berry Smoothie is so delicious and really good for you. I only recently discovered coconut yoghurt at a health food store in Amsterdam and I have fallen head over heels in love with it. One of my former comfort foods used to be eating a huge bowl of yoghurt with lots of different fruits. Unfortunately, whenever I ate it, I always ended up having a nasty stomach ache. As also avoid processed soy products like soy milk and soy yoghurt, I have been unable to really enjoy yoghurt lately. Coconut milk yoghurt tastes unbelievably good. It contains plant-based probiotic cultures which aid with digestion and support gut health. Coconuts are real super foods and coconut yoghurt therefore has many of its health benefits. It is rich in lauric acid, a medium-chain fatty acid, that boosts your immunity and helps fight off viruses, bacterial infections and fungal infections, such as candida. This Berry Coconut Yoghurt Berry Smoothie contains sufficient lauric acid to be of great benefit to your health. Combined with the berries, which also help strengthen the immune system and reduce inflammation, this smoothie is an excellent immunity booster. I recommend having this Berry Coconut Yoghurt Berry Smoothie for breakfast or as a post-workout recovery drink. Add all ingredients except for the chia seeds and grated coconut to a high-speed blender. Pulse until smooth. Pour into glasses and serve with grated coconut and chia seeds on top.